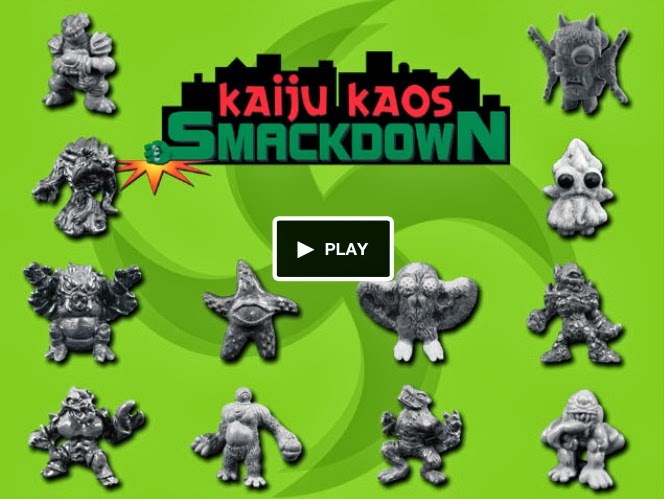 Ironhaus Productions OZ: PRESENT to FUTURE - KAIJU KAOS: SMACKDOWN now on Kickstarter! PRESENT to FUTURE - KAIJU KAOS: SMACKDOWN now on Kickstarter! Archeon Creations are celebrating their 1st Anniversary by offering their Kaiju Kaos: Smackdown resin mini-figures in an enticing new Kickstarter which is currently LIVE right now! There are a total of 12 mini-figures available the begin with sculpted by many well known talents such as Jimmy Rommel, Lee Burbridge, Steve Pratt, Bryan K. Borgman & Danny Samuels, as well as a host of stretch goals in the form of MORE cool Smackdown figures! The figures will be handmade and cast in a durable Urethane palstic approx. 50mm tall and will be available for the first time in an KS Exclusive colour, Vivid Slime Green made with Monster Kolor Dye. There's even a couple of neat Add-Ons as well so you can pick up everything you need to get started playing, including a Rule Book & a CD Sountrack both for $5 each. Lets have a look at the 12 figures on offer! The best thing about this KickStarter is that you can choose exactly which figures you want form the 12 on offer, which can be chosen however you please! You can get one of each if thats what you like, or if theres one you dont like you dont have to get it. You can also army build on your favourite figure too, which is a nice option to have. The figures themselves are a steal at this price, and a fraction of the norm you would pay for something like this. Great value! Some Stretch Goals figures have been hinted at in the KS video, but there is little info available on these guys at this time. If you want to see them happen, put in a pledge so we can get past the $1.8K goal and have them unlocked! Head on over to the Kaiju Kaos: Smackdown KickStarter to find out more and get pledging. Im in for a full set. We've passed the halfway mark so lets do our best to push it over the line and get those stretch goal figures unlocked! All photos courtesy of Archeon Creations.